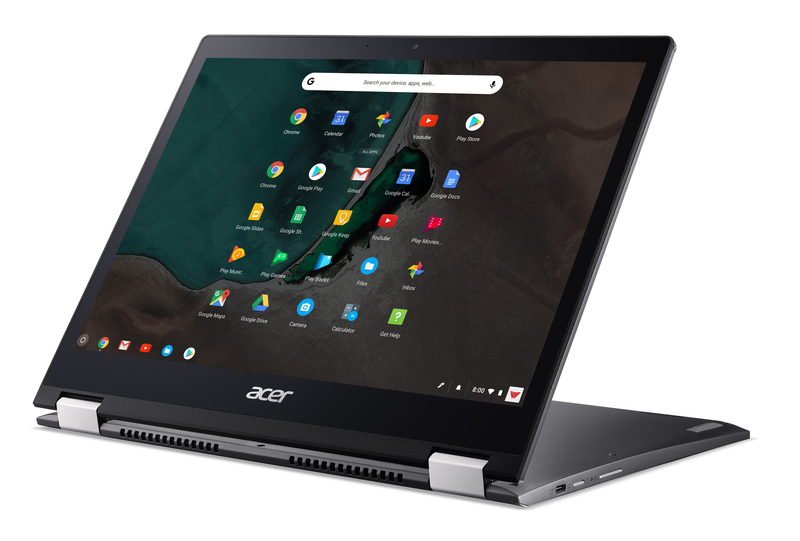 It's been quite a while since we've heard about the Acer Chromebook 13 and Chromebook Spin 13, but it looks like we'll have to wait another few months for them to make it stateside. The Chromebook 13 and Chromebook Spin 13 are coming to North America in September, and they'll start at $649.99 and $749.99, respectively. Both the 13 and Spin 13 are on the upper end of the Chromebook market. They both come with 13.5" 2256x1504 IPS displays and all-aluminum builds, but the Spin 13 adds a touchscreen display, a 360-degree hinge, and a Wacom EMR stylus with its own slot. Both have two USB 3.1 Type-C ports. We should also be seeing day-1 Linux app support from them. It looks like Acer decided to nix the Pentium and Celeron processors for the Chromebook 13 for the North American market, meaning that it now starts at $649.99 and not the previously-stated $399.99. Even with that said, you'll have to go for the Chromebook Spin 13 if you want more than 8GB of RAM and/or 32GB of storage. The Chromebook 13 and Chromebook Spin 13 will land in the US and Canada sometime in September. 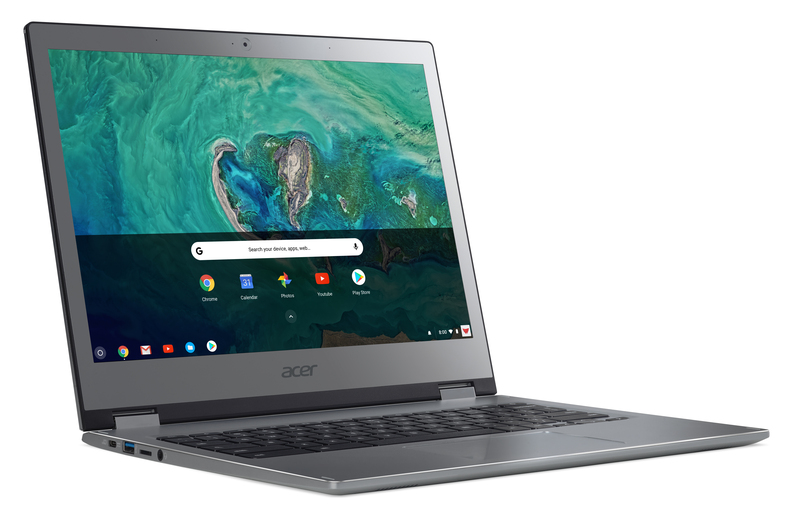 San Jose (Aug 2, 2018) – Acer America today announced that its two new premium Chromebooks – the Acer Chromebook Spin 13 and Acer Chromebook 13 – will both be available through the channel to commercial customers in North America starting in September. The Chromebook Spin 13 is priced starting at $749.99 and the Chromebook 13’s pricing starts at $649.99. Both models were designed for business customers and feature a stylish and durable all-aluminum design with a Full HD+ 13.5-inch display in a productivity-boosting 3:2 aspect ratio. The new Chromebooks provide the speed, simplicity and security required in professional environments. Plus, they encourage collaboration and are easy to deploy, share and manage by IT staffs. The Chromebook Spin 13 (CP713-1WN) is a convertible model with hinges that allow it to be opened a full 360-degrees, so the touchscreen display can be used in four versatile modes. It includes aWacom EMR stylus for note-taking, sketching and interacting with the display. After use, the stylus can be kept safely in the Chromebook Spin 13’s storage slot. The CP713-1WN-385L has an 8th Generation Intel Core i3-8130U processor, 8GB LPDDR3 memory and 64GB eMMC storage for $749.99 USD and $1,029.99 CAD. The CP713-1WN-55HT has an 8th Generation Intel Core i5-8250U processor, 8GB LPDDR3 memory and 64GB eMMC storage for $849.99 USD and $1,149.99 CAD. The CP713-1WN-59KY has an 8th Generation Intel Core i5-8250U processor, 16GB LPDDR3 memory and 128GB eMMC storage for $949.99 USD and $1,299.99 CAD. The CB713-1W-36XR has an 8th Generation Intel Core i3-8130U processor, 8GB LPDDR3 memory and 32GB eMMC storage for $649.99 USD and $899.99 CAD. The CB713-1W-56VY has an 8th Generation Intel Core i5-8250U processor, 8GB LPDDR3 memory and 32GB eMMC storage for $749.99 USD and $1029.99 CAD. 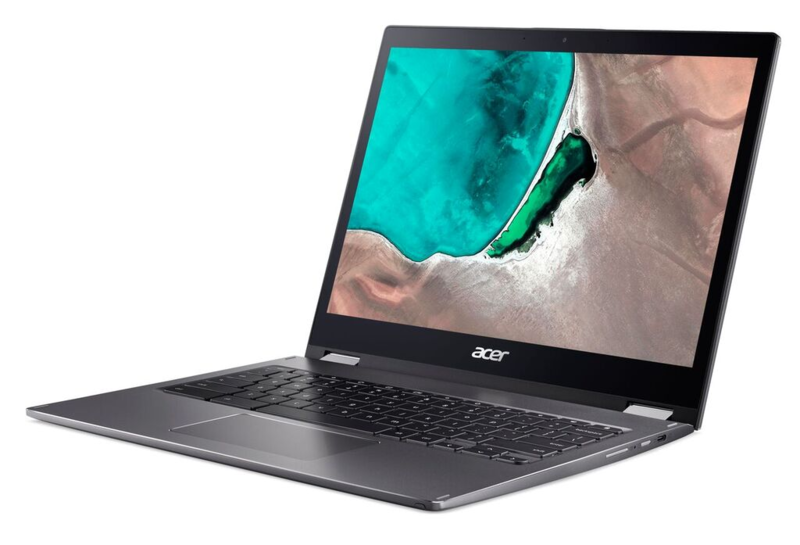 Both the new Acer Chromebook Spin 13 and Acer Chromebook 13 feature an IPS 13.5-inch Full HD+ display with 2256x1504 resolution for enjoying apps, documents and video in 3.3 million vibrant pixels.The display’s 3:2 aspect ratio adds 18 percent more vertical space compared to an equally wide 16:9 display, so customers will view more on their display. Sporting a professional and modern look, the Chromebook Spin 13 and Chromebook 13 each have an all-aluminum design with attractive diamond-cut effects. The sandblasted matte aluminum cases are durable and comfortable to hold. Plus, they feature a Corning® Gorilla® Glass touchpad that provides smooth navigation when browsing the web and using apps. 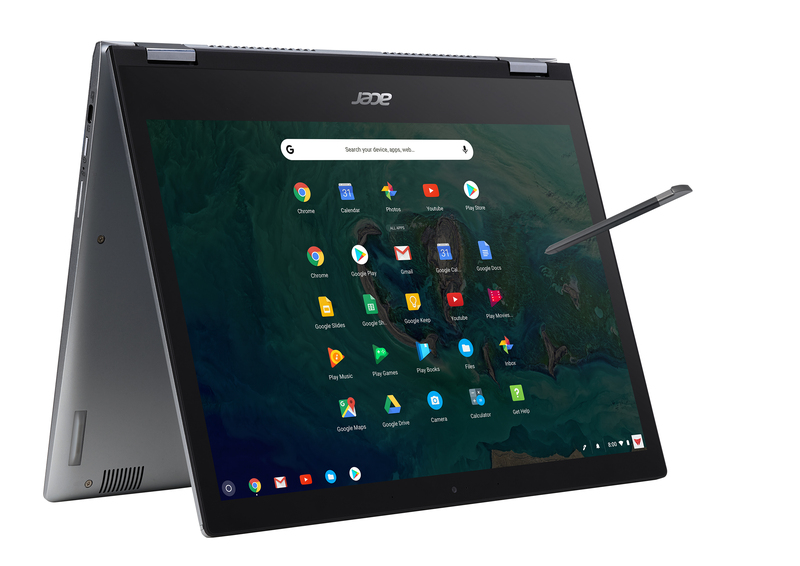 Fast, simple to use and secure, the new Chromebooks utilize Chrome OS to enable their teams to create, connect and share with others. They fully support Android apps via Google Play, so customers can have access to Chrome apps and more than two million Android apps for productivity, connectivity, and more. The new Acer Chromebooks are the right choice for environments where employees share their work computer – they can simply log into their Google account to access Gmail, Google Docs, apps, extensions, bookmarks, and more. Plus, files can be stored on Google Drive(2) which protects files, documents, and photos safely in the cloud, and ensures that the most current version of the file or document is always available and safe, even if the Chromebook is lost or stolen. Plus, Chrome OS is regularly updated to provide more functionality and multiple levels of security to guard against ever-changing online threats. © 2018 Acer America Corporation. All rights reserved. 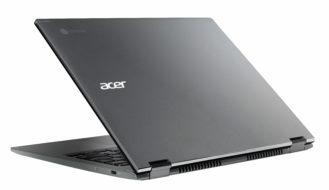 Acer and the Acer logo are registered trademarks of Acer Inc. Other trademarks, registered trademarks, and/or service marks, indicated or otherwise, are the property of their respective owners. All offers subject to change without notice or obligation and may not be available through all sales channels. Prices listed are manufacturer suggested retail prices and smay vary by location. Applicable sales tax extra. Battery life is based on Google power_LoadTest for non-touch model (http://www.chromium.org/chromium-os/testing/power-testing). Actual battery life varies by model, configuration, applications, power management settings, operating conditions, and utilized features.